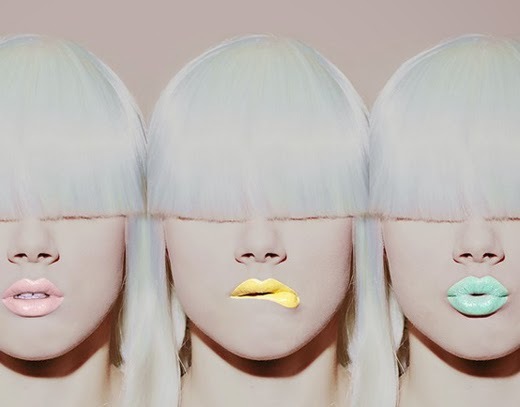 M for Make-up: My spring's favorite: pastel lips! -EN: This spring is all about pastel colors. I like them so much, that they even became a favorite in my make-up mood, more precisely for the lips! The roseish-, orangeish- and violetish colors look fantastic on almost everyone! Fore those of you who love trying something new I'm totally addicted to the yellow, mint green and light blue colors the look awesome! I love these pastel colors because they look so fresh, lovely and feminine, they totally wake my spring feelings up! And it's something new to try! Important for these pastel colors is, that you take a really covering lipstick so the lip color won't shine through. Otherwise wise it looks a bit odd and not so good. Of course you'll find almost all of these fabulous colors at Lime Crime, which I already presented in a previous post. Also really good covering and long-lasting lipsticks are the MAc ones, but the colors will more stay in the roseish tones. One of my apricot-colored favorites is "Mystique" from Chanel. -DE: Diesen Frühling sind Pastelltöne sehr angesagt, was mir so gut gefällt, dass ich es auch auf meine Make-up-Lieblinge diesen Frühling anwende und zwar für die Lippen! Die Rosa-, Orange- und Violett Töne stehen jedem und für die mutigeren finde ich auch das Gelb, Minze und Hellblau einfach fantastisch! Ich finde die Farben wirken so frisch, zart und feminin und wecken so richtig die Frühlingsgefühle in mir! Und vor allem sind sie auch etwas neues! Was ich dabei wichtig finde ist, dass die Farbe deckend ist, sonst wirken die Farben nicht wirklich gut und es sieht nicht gut aus. Die grösste Auswahl findet ihr natürlich bei Lime Crime, über die ich bereits einen Post gemacht habe. Auch supergut deckende und langanhaltende Lippenstifte gibt es von MAC, aber halt eher in den rosafarbenen Nuancen. Einer meiner Apricot-farbenen Lieblinge ist der "Mystique" Lippenstift von Chanel.